From the funny to the useful! This week, teacher Sandy wrote into the WeAreTeachers HELPLINE! asking for ideas on bathroom passes. “Anyone do anything creative for bathroom or hallway passes?” she asked. “My school doesn’t mandate the written Post-its anymore, and I’m looking to replace them with something a little more interesting and efficient.” Here are some of the top suggestions. “One teacher at my school uses a ‘Pee-Rex’—a T-rex. dinosaur doll.” —Stefanie B. “My bathroom pass is a plunger!” —Jennifer B. “I have two bottles of hand sanitizer with boys on one and girls on the other. They take the bottle and set it on their desks when they go, so I know who is gone. When they get back, they use the hand sanitizer. Of course, I tell them to wash with soap and water in the bathroom, but this is an extra measure since I’m 100% sure that most don’t!” —Laurie H.
You could also have them carry the sanitizer to and from the bathroom if your school requires them to bring a physical pass to the bathroom. “I laminated name plates, punched a hole in them, and hung them from a lanyard. 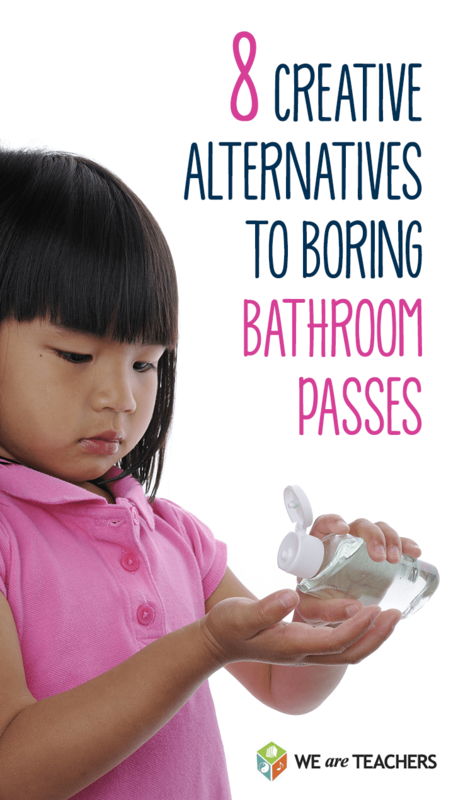 The kids can hang them around their necks, and I can spray them with Lysol.” —S.K.O. Or, on a smaller scale: “I’ve used clothespins in the class. Students clip them to their shirts.” —Patty R.
“I went to Michael’s and bought huge wooden ‘B’s. I painted one blue, the other one red, and put my name on both with a black Sharpie. Those are my passes.” —Jeanine K.
“We use a Google form now. Kids check out on a tablet and check back in when they come back to the room. It allows us to track how often they’re out of the room, and if there’s ever a problem in the bathroom, we can see who was in there at that time.” —Ann M.
Stick to your class theme. “I use safari rubber ducks. They match my room theme and are easy to clean and sanitize with Lysol.” —Stephanie G.
Use … an actual toilet?! “I replaced a toilet in my house, then took the cheap plastic seat/lid that came with it to school. I put my name and room number on it. It worked to keep my students in class and not walking around in the hallway when they left my room!” —Amy H.